A "Flower Kissing Ball", also known as a pomander, is a round ball of flowers with a ribbon handle thread through it. These bouquets got their beginnings with the popularity of Christmas kissing pomanders, where couples in love traditionally kiss under a ball of mistletoe hung from a doorway. 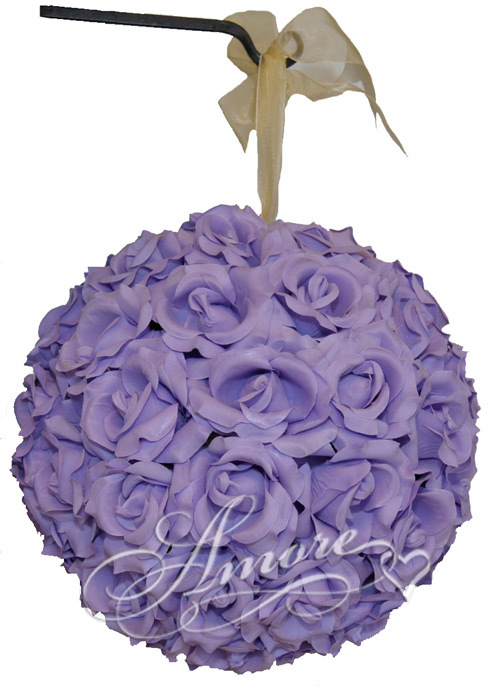 Our 8 inches Lavender Silk Kissing Ball match with our silk lavender petals and bride bouquets. They are made with high quality silk open roses. Ribbon include!